Mens semifinals. Werdum shoots and takes Saulo down. Working to pass Saulos halfguard. Cyborg pulls guard on Monson. Monson trying to pass Cyborgs open guard. Saulo almost sweeps Werdum. Werdum now stands up, tries to pass standing. Werdum on Saulos back. Scramble. Restart standing. Werdum shoots, Saulo sprawls. Both going for takedowns. Overtime and both Werdum and Saulo gets warned. Cyborg and Monsen into overtime. Cyborg shoots a single on Monson, doesnt get it. Cyborg takes Monson down, almost getting his back. Going for an armbar, Monson slips out. Werdum gets a second warning. Monson on top in Cyborgs guard. Saulo shoots in again, gets a single leg, pushes Werdum out of the mats. Monson and Cyborg back on their feet. Cyborg shoots another single. Almost gets it. Saulo Werdum second overtime. Werdum shoots, almost gets it, Saulo turns and gives the back. Then rolls to guard. Cyborg Monson second overtime. Monson shoots singleleg, Cyborg reverses. Stays on top but ouside of the mats. Werdum almost gets another takedown, lands outside. Monsen gets back up on all four. Both back to their feet. Werdum almost getting a takedown, but Saulo spins out again. Cyborg shoots a single. Werdum gets Saulos back. Cyborg on Monsons back. Cyborg suplexes Monson. Werdum wins. Cyborg shoots another single. Cyborg beats Monson. Xande pulls guard on Vinny Magalhaes, switches to halfguard. Glover Teixeira shoots. Vinny tries kimura from top. Rialdi shoots and gets a huge takedown. Then locks an arm triangle choke. Glover gets out. Glover shoots. Xande pulls guard again. Gets Vinnys back but Vinny escapes góes for leglock. Xande escapes and stays on Vinnys back. Rinaldi almost gets another takedown but Glover gets back to his feet. Glover shoots for single. Now Rinaldi on Glovers back. Vinny escapes, both back on their feet. Rinaldi almost gets takedown. Xande shots a single, scramble, Vinny defends and Xande gets his back. Vinny pulls guard. Xande stands up, tries to pass. Rinaldi gets Glovers back standing, no hooks. Overtime starts on both mats. Glover gets headlock on Rinaldi. Rinaldi escapes. Vinny gets warned, Xande attacks the back. Rinaldi almost pass Glovers, gets the back. Rinaldi now mounted on Glover. Xande has both hooks in on Vinny. Glover and Rinaldi back to their feet. Xande wins. Rinaldi wins. Avellan vs Galvão. Avellan gets a takedown. 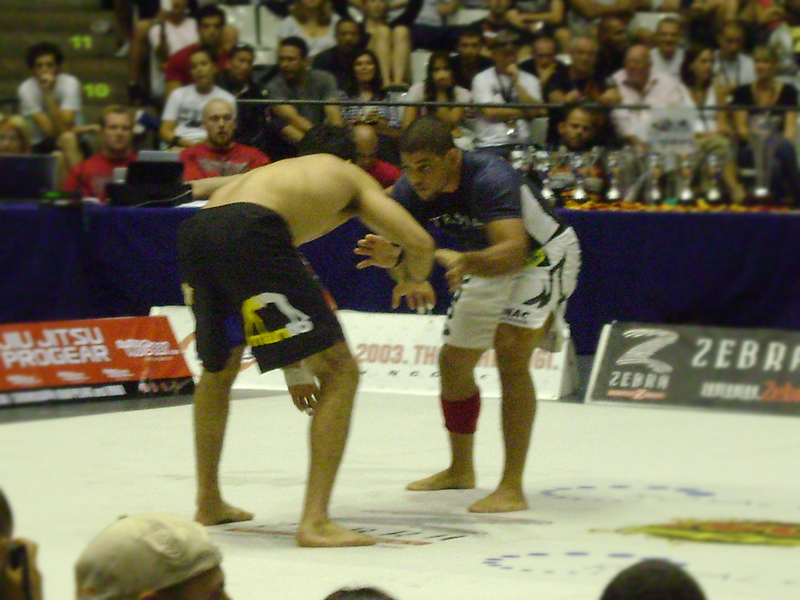 Galvão tries to sweep from his open guard. Braulio jumps to guard and sweeps Lovato directly. Braulio attacks with leglock, Lovato defends. Avellan working to pass. Braulio goes for another footlock, Lovato taps! Lovato looks injuried. Galvão almost sweeps Avellan, but Avellan looks stable on top. Lovato gets carried of the mats by Saulo. Avellan attacks with a leglock. Switches to heelhook. Galvão refuses to tap. Gets up and gets a single, takes down Avellan! Galvão almost passing the guard. Garcia pulls guard on Nakamura. Garcia sweeps Nakamura, mounts directly. Switches to sidemount. Galvão shoots single and Avellan counters with a kimura! Garcia taps Nakamura with his guillotine choke after about two minutes. Galvao escapes the kimura and gets the win. Gregor Gracie jumps to guard with Popovitch on top. Cobrinha pulls guard on Rani. Cobrinha sweeps Rani. Gregor attacks with a omoplata. Cobrinha trying to pass Ranis halfguard. Cobrinha now attacking Ranis arm. Rani gets to all four. Cobrinha gets the kimura and Rani taps! Popovich trying to pass the guard of Gregor. Mendes jumps to guard, Leo Vieira on top. Stands up with Mendes in closed guard. Leo opens guard trying to pass. Popovich gets Gregors back, gets rear naked, Gregors face turning blue. Popovich almost taps him as time run out. Popovich wins. Mendes gets Leos back. Scramble, Leo pulls guard. Mendes trying to pass, attacking Leos neck with guillotine, almost gets it. Leo gets out. Leo and Mendes in a leglock war. Both want to sit in the guard. Noone stands up. 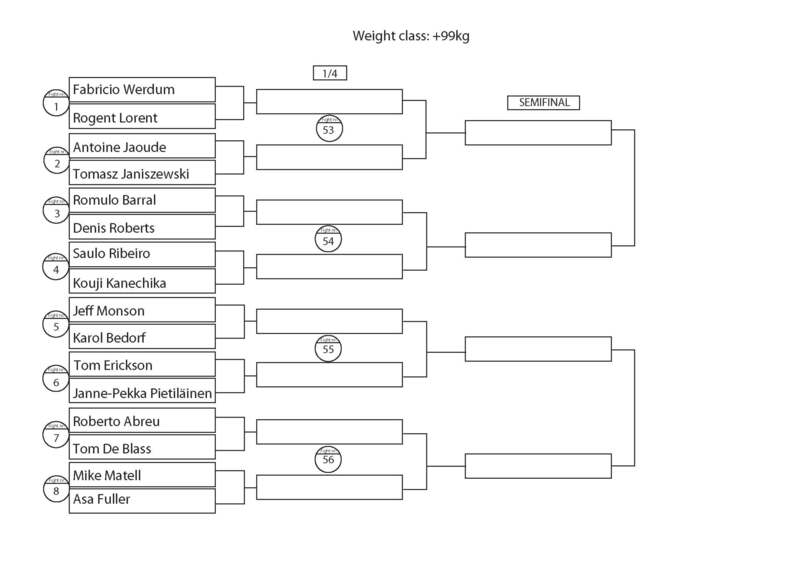 Womens semis start. Cyborg vs Penny Thomas. Penny jumps guard, but Cyborg just pushes her away. Mendes finally sits up trying to pass. Both stand up, Mendes going for takedown, gets sweep, Mendes on Leos back, Mendes tries to jump to get the hooks, Leo ducks, Mendes flies over! Leo passing the guard. Mendes gets Leos back. Attacks with rearnaked, atacks the arm. Gets neither. Times up, overtime. Mendes shoots in. Leo sprawls, Leo takes down Mendes. But Mendes sweeps rightback. Gets Leos back again. Both hooks in. Mendes submits Leo! Penny locks triangle, Cyborg stands up and gets out! Cyborg almost passing the guard of Penny. Penny rolles to all four. Times up, overtime. Hanette Staack jumps to guard. Rosangela on top. Cyborg goes for leglock. Penny escapes and gets on top, tries to get Cyborgs back but falls over. Cyborg tries to pass and hits Penny with a knee in the face.. Times up, overtime. Penny wins by two minus points to one. Rosangela stuck in Hanettes halfguard for a long time.. times up, overtime. Sayaka jumps to a leglock on Hillary. Sayaka attacks with another leglock. Hillary gets out. Sayaka attacks arm, and Hillary taps! Luanna and Laurance Cousin jumps to guard at the same time. Cousine attacks the leg, Luanna spins out. Luanna ends up on top, working to pass. Hannete Stack wins. Saulo enters the arena with his gijacket, shorts and blackbelt. Cousine and Luanna gets a warning each, overtime. Luanna shoots. Gets back, but not hooks. Monson trying to pass Saulos guard. Luanna gets rear naked choke, Cousin face gets blue, but gets out! back to Cousins guard. Luanna passes, but Cousin retains her guard. Cousine sweeps, almost gets Luannes back, but falls down. Luanna working t pass. Times up, second overtime. Luanna, Cousin almost gets guillotine, landing outise the mats. Monson almost gets Saulos back, but no hooks. Both get back to their feet. Both Luanna and Cousin gets warned. Luanna gets takedown but lands outside of mats. Saulo shoots single, Monson escapes. Luanna gets Cousin back and a rearnaked, this time Cousin taps! Monson on Saulos back again. Times up, overtime. Saulo shoots, Monsom sprawls and spins to Saulos back. Vinny jumps guard against Glover Teixera. Vinny gets back up. Jumps to guard again. Executes a beautiful sweep and ends up in mount. Spins for armbar, almost gets it, switches to triangle, switches again to omoplata. Glover stands up and gets out. Both back on their feet. Vinny jumps to guard again. Attacks omoplata, Glover escapes but looks tired. Vinny shoots in and glover spins for Vinnys back, scramble and Vinny on glovers back, both hooks in. Vinny sinks triangle and submits Glover with an armbar. Monson beats Saulo on judges decision. Saulo emotional, grabs ruce Buffers mic and announces his retirement. To everyones surprise, Lovato enters the mat limping, with his foot in a bandage and will fight Avellan. Lovato pulls guard right away. Gregor Gracie pulls guard with Nakamura on top. Avellan attacks Lovatos injuried foot. Avellan wins. 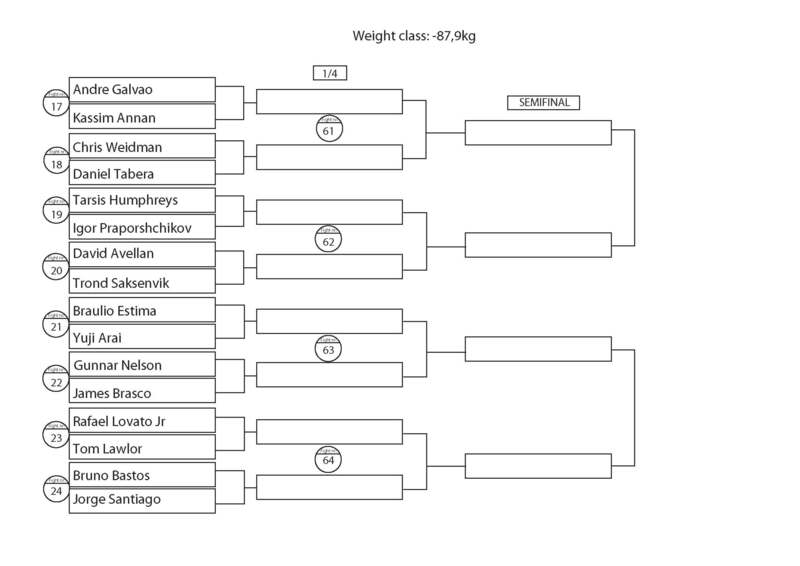 Rani injuried, going to the hospital and Leo sick, so bronzematch will be between Ryan Hall and Jeff Glover. Glover pulls guard, Ryan passes, scramble. Back on their feet. Glover pulls guard again. Ryan attacks with a arm triangle choke, Glover escapes. Nakamura still on top in Gregors guard, not much action. Glover sweeps Hall and goes for leglock. Nakamura now on Gregors back. Gregor escaping and working for the pass. Gets a guillotine and mount, Nakamura escapes, Gregor in sidemont. Nakamura pushes him away. Back to their feet. Gregor gets takedown and passes the guard. Gets the back. Times up, Gregor wins. Ryan and Jeff back in their feet. Times up, overtime. Glover gets takedown. On top in Ryans guard. Ryans goes for Glovers back, one hook in. Glover trying to escape, but Ryan gets second hook in the last seconds and the win, 3-2! 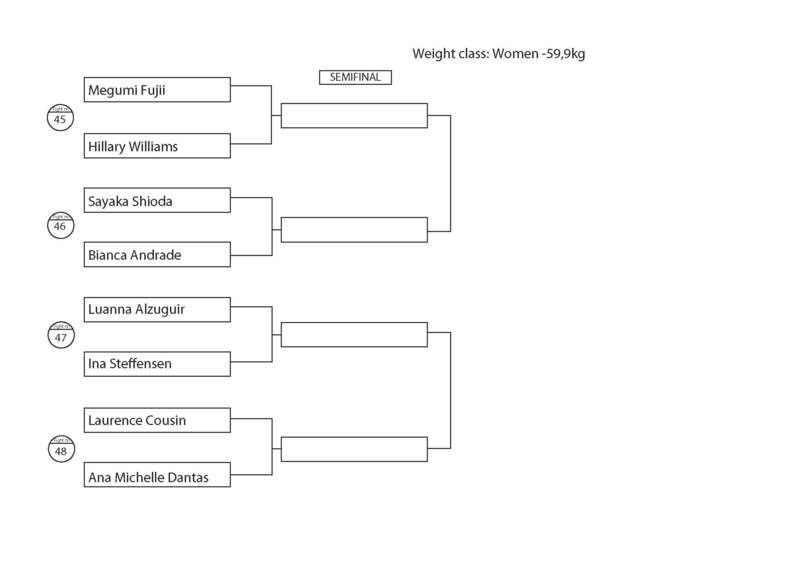 Womens bronzematches starts. Cousin jumps to guard against Hillary. Female Cyborg and Rosangela fights stand up. Hillary almost passing. Cyborg gets singleleg. Rosangelo gets out. Hillary passes the guard. Cyborg and Rosangela into overtime. Cousin gets back the guard, attacks with leglock. Hillary escapes and passes again. Rosangela takes down Cyborg, but Cyborg gete back up on her feet before three seconds. Hillary wins. Cyborg wins. Mens finals. Werdum vs Cyborg. Cyborg shoots in, Werdum sprawls and spins for back but slips off. Cyborg in Werdums guard. Cyborg passes and gets Werdums back. Werdum escapes, Cyborg almost gets triangle, Werdum escapes again. Werdum now on top, putting pressure on Cyborg. Werdum stays on top in halfguard along time. Gets warned. Twice. Almost passes, Cyborg defends, then Werdum passes the guard. Cyborg escapes. Both back to their feet. Cyborg shoots, Werdum sprawls. Werdum tries to spin for the back, Cybor attacks with triangle, but doesn´t get it and returns to guard. Werdum on top, trying to pass. Cyborg looks tired. Werdum gets the pass. Werdum passive, gets minuspoints. Twice. Werdum back to halfguard and passes again. One more minuspoint to Werdum. Back to halfguard. One more minus to Werdum. Both get back to their feet. Times up, Werdum wins a strategically smart but boring fight. Xande vs Rinaldi. Rinaldi shoots for single, takes down Xande. Rinaldi on top in Xandes halfguard. Xande looks for the sweep, but Rinaldi stays on top. Rinaldi attacks with leglock, Xande escapes and now on top. Rinaldi attacks with omoplata, Xande escapes. Xande on bottom again. Rinaldi attacks Xande with a kimura from top. Xande stays calm, escapes and sweeps. But Rinaldi sprawls out and escapes. Stays on top in Xandes guard. Rinaldis tries headlock, Xande escapes. Xande sweeps. Rinaldi attacks with leglock. Xande escapes. Rinaldi now on Xandes back, no hooks in. Xande gets back to guard. Rinaldi trying to pass, attacks with kimura. Xande escapes and sweeps. Xande now passing. Rinaldi gets back to feet. Xande on all four, Rinaldi jumps to get the back. Rinaldi attacks Xandes leg, but Xande escapes. Times up, Xande wins. Braulio vs Galvão. Galvão sits to guard and gets a minuspoint. Braulio attacks with the same footlock he tapped Lovato with. Galvão defends and almost sweeps Braulio, but chooses to stay on bottom. Braulio working to pass. Galvão looking for sweeps. Almost gets leglock, but Braulio escapes. Galvão gets sweep, but Braulio attacks the arm. Galvao escapes. Braulio attacks the leg, switches to footlock. Galvão escapes. Braulio attacks single leg, takes Galvão down, but no points yet. Galvão attacks Braulios arm. Scramble, Galvão gets a sweep. And working to pass, almost passes, but Braulio gets an inverted triangle, Galvão taps! Garcia vs Popovich. Popovich gets a takedown and is almost passing. Garcia retains guard and sweeps. Popovich with closed guard, Marcelo attacks with footlock. Popovich escapes. Garcia sweeps again. Passes and takes back. Popovich escapes! Garcia on top again. Popovich gets a sweep. Popovich on top. Popovich working to pass. Manages to neutralize Garcias bottomgame well. Popovich grabbing Garcias shorts repeatedly, eventhough its against the rules. Garcia gets omoplata. Sweeps. Garcia in Popovich closed guard, stands up, opens guard trying to pass, Popovich gets back to feet. Garcia jumps guard, gets minus. Popovich stalling but doesn´t get minus. Garcia trying to sweep. Popovich is now backing away alot. Popovich gets one minus. Popovich keeps stalling for long time but doesn´t get more minuspoints. 40 seconds left. Popovich passes Garcia guard! Garcia gets out. Back on their feet. Popovich escapes and backs away. Gets another minus. Time is up, fight should go to overtime. The judges removes the last minus they gave to Popovich. Popovich gets a controversial win. Rubens Charles vs Rafael Mendes. Cobrinha goes for a nice armdrag and gets the takedown. Both back to their feet. Cobrinha goes for the same takedown, Mendes gets arm triangle choke. Cobrinhas face turns blue, but escapes! Mendes attacks with heelhook from guard. Both back to their feet. Cobrinha gets the same takedown, Mendes the same arm triangle choke! Noone breathes, looks like Cobrinha is going to tap, but he escapes again! Cobrinha takes Mendes down. Return to feet. Cobrinha gets another huge takedown. Mendes gets a sweep, but no points yet. Now points starts counting, Mendes on top in Cobrinhas guard. Cobrinha sweeps, scramble, Cobrinha on top, but no points for sweep. Cobrinha working to pass. Mendes attacks with sweep, but Cobrinha counters with heelhook. Mendes escpaing. Cobrinha gets calfcrunch, Mendes escapes but gets sweeped. Mendes attacks Cobrinhas leg again. Mendes gets tight kimura. Cobrinha miraculously escapes. Scramble. Back to their feet. Overtime. Both on their feet, not alot of action. Mendes shoots, Cobrinha sprawls. Again. Cobrinha shoots for single, Mendes escapes. Second overtime. Cobrinha shoots for single, gets back. Mendes still standing. Mendes rolls for leglock and escapes. Both back to thier feet. Cobringa hás Mendes in a headlock, Mendes goes to guard. Mendes almost gets a sweep. Almost gets sweep again, but Cobrinha escapes. Cobringa attacks with heelhook. Mendes escapes and gets sweep. Cobrinha stands up, Mendes gets Cobrinhas back, both hooks in! Timus up, Mendes wins by points after 40 minutes! 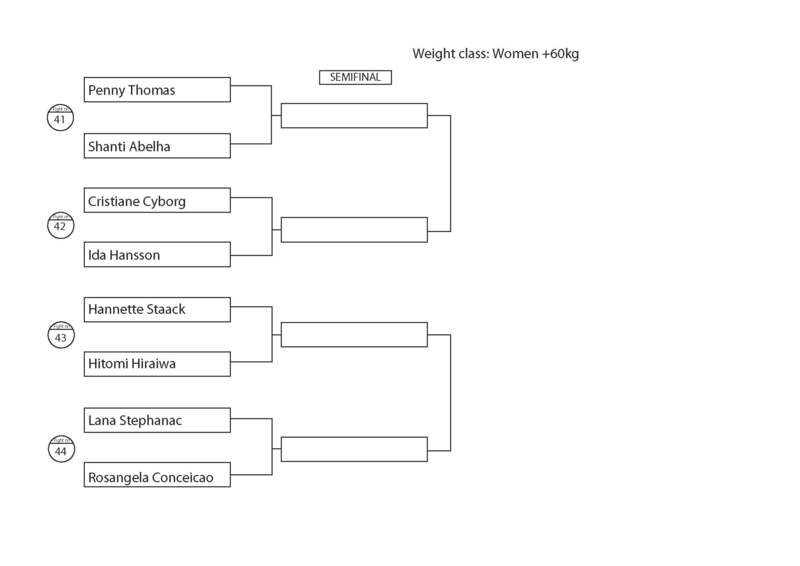 Womens finals start. Penny shoots in and Staack spins and gets Pennys back, both hooks in. Penny escapes, and is now on top, trying to pass. Staack is trying to get a kneebar. Almost gets it. Stays there for a long time. Penny Thomas finally taps! Staack wins by submission. Sayaka Shioda vs Luanna Alzuguir. Sayaka attacks with leglock, Luanna trying to pass. Passes and mounts but Sayaka bridges and escapes. Sayaka now on top in Luannas guard. Luanna reverses, Sayako rolls for kneebar, but Luanna escapes. Luanna gets guillotine., Sayaka escapes. Luanna sweeps again, is now on top trying to pass. Sayaka góes for heelhook, Luanna escapes. Both back to their feet. Luanna shoots in, goes to guard, almost gets a sweep. Luanna gets Sayakas back. Sayaka escapes, but Luanna got three points. Times up, Luanna wins! Absolute starts. Garcia vs Bastos. Braulio jumps to guard against Janne-Pekka, attacks the arm, Janne-Pekka taps! Garcia goes for takedown, gets reversed. Bastos on top in Garcias guard. Dean Lister jumps to halfguard, Vinny Magalheas on top. Vinny working to pass. Lister attacks Vinny with heelhook form 50/50 guard. Vinny gets out and passes Listers guard. Lister gets back to guard. Attacks with leglock, switches to sweep, Vinny goes to all four, Lister trying to get the hooks. Garcia and Bastos goes into overtime. Marcelo gets takedown on Bastos. Lister and Vinny back to their feet. Garcia passing the guard of Bastos. Lister on top in Vinnys guard. Bastos retains guard. Garcia passes again. Vinny gets omoplata. Garcia gets Bastos back. Garica gets the rear naked choke, Bastos taps! Lister attacks with a leglock, Vinny ends up on top. Both back on their feet. Vinny shoots in. Almost gets back. Attacking with sidechoke. Lister escapes! Lister on bottom in halfguard. Vinny passing but Lister escapes to all four. Weidman controls the action standig up against Jaoude, eventhough he is much lighter. Vinny beats Lister by points. Xande pulls guard on Ricco Rodrigues. Xande attacks with sweep, ends up on Riccos back. Ricco rolls out, ends up in halfguard with Xande on top. Xande goes for kimura, gets the tap. Xande advances to the quarterfinals. Overtime between Weidman and Jaoude. Galvão pulls guard on Tom DeBlass. Weidmans almost gets the takedown, gets the back. Galavao gets the sweep. DeBlass reverses. Galvao tries to sweep from halfguard. DeBlass stable on top. Galvão gets the sweep. Weidman wins. Galvão defends a sweep passes and gets the back, both hooks in. DeBlass escapes, now trying to pass Galvaos guard, attacks with footlock. Galvão defends. Times up, Galvão wins. Cyborg pulls guard on Avellan. Gunnar Nelson pulls guard on Monson. Cyborg almost gets a sweep. Monson has a lot of trouble passing Nelsons guard. Cyborg attacks with a kimura. Nelson and Monson into overtime. Nelson shoots. Monson sprawls, Monson shoots and gets reversed! Nelson almost getting the back of Monson. Avellan and Cyborg goes to overtime. Monson looks tired. Avellan gets takedown. Cyborg attacks with leglock. Gets Avellans back, standing up. Cyborg throws Avellan with a suplex, gets backmount. A much smaller Nelson keeps pushing Monson from the mats. Crowd is cheering. Nelson and Monson goes into second overtime. Nelson shoots, Monson looks tired but manages to sprawl and reverse. Nelson almost gets his back again. Cyborg almost gets takedown. Monson has headlock on Nelson. Nelson esacpes. Both back on their feet. Nelson shoots and Monson sprawls and spins to his back. Nelson escapes. Monson shoots, but cant get the takedown. Nelson shoots in and gets the back. Both hooks in. Attacks the arm. Times up, Nelson wins by points and the whole arena is standing up cheering! Avellan wins. Quarterfinals. Braulio vs Garcia. Braulio jumps guard. Garcia trying to pass. Vinny pulls guard on Weidman. Gets the sweep. But Weidman gets back to his feet. Vinny submits Weidman with flying armbar! Braulio gets a sweep on Garcia. Braulio passes the guard of Garcia. Gets Garcias back and a rear naked choke. Garcia taps! Xande pulls guard on Galvão. Gets Galvaos back. Galvaos escapes, both back on their feet. Xande pulls guard, goes for a sweep and gets to the back of Galvão. Nelson and Avellan starts. Xande trying to put the hooks. Nelson takes Avellan down, but no points scoring yet. Gunnar gets another takedown on Avellan. Nelson gets headlock, switches to singleleg. Avellan shoots, takes Nelson down, but Nelson spins out and takes Avellan down. Attacking his back, one hook in. Xande wins by points. Avellan escapes. No points. Avellan shoots in, Nelson defends. Avellan shoots for single leg, Nelson defends. Nelson shoots in, Avellan attacks the arm. Nelson gets the back, one hook in, Avellan taps to a rear naked choke! Semifinals. Vinny Magalheas vs Braulio Estima. Xande vs Gunnar Nelson. Xande and Vinny jumps guard. Vinny sweeps. Scramble, Braulio attacks leg, Vinny defends. Xande attacks Nelson with a knnebar from guard, Nelson defends. Nelson almost passes Xandes guard. Gets Xandes back with one hook in. Braulio attacks Vinns leg again. Xande gets Nelson leg, submits him with a kneebar! Braulio almost sweeps Vinny. Vinny attacks with leglock, Braulio defends and gets Vinnys back! Gets points, but Vinny spins out. Now on top i Braulios guard. Braulio gets a sweep. Times up and Braulio wins by points. Bronze match. Gunnar Nelson vs Vinny Magalhaes. Vinny pulls guard. Nelson almost passes Vinnys guard. Vinny attacking Nelson s leg, Nelson gets out and counterattacks with a leglock, Vinny gets out, Nelson gets singleleg, Vinny jumps guard. Vinny attacking Nelsons arm, Nelson spins out and gets Vinnys back. Vinny escapes and gets Nelsons back, Vinny suplexes Nelson, Nelson bounces up directly and goes for single. Vinny jumps to guard, Nelson goes to the back. Times up. First overtime. Nelson shoots gets Vinnys back. One hook in. Vinny escapes. Vinny goes for a firemans throw and throws Nelson. Nelson escapes back to his feet. Vinnys gets a singleleg, takes Nelson down, but Nelson jumps back up. Nelson shoots a single. Doesnt get it. Second overtime starts. Vinny gets an armdrag takedown, manages to keep Nelson down and gets the points. Times up. Vinnys beats Gunnar Nelson by points after two overtimes. Absolute final starts. Braulio vs Xande. Xande ducks under and gets a takedown. Braulio attacks Xandes arm and gets an inverted triangle! Braulio attacks the arm again, Xande defending but is in trouble. Xandes face turning blue. Xande stands up, face turns from blue to purple. Xande manages to escape! Xande trying to pass, Braulio catches him with som kind of omoplata shoulderlock from the guard, Xande screams and submits. Xandes shoulder seems injuried. 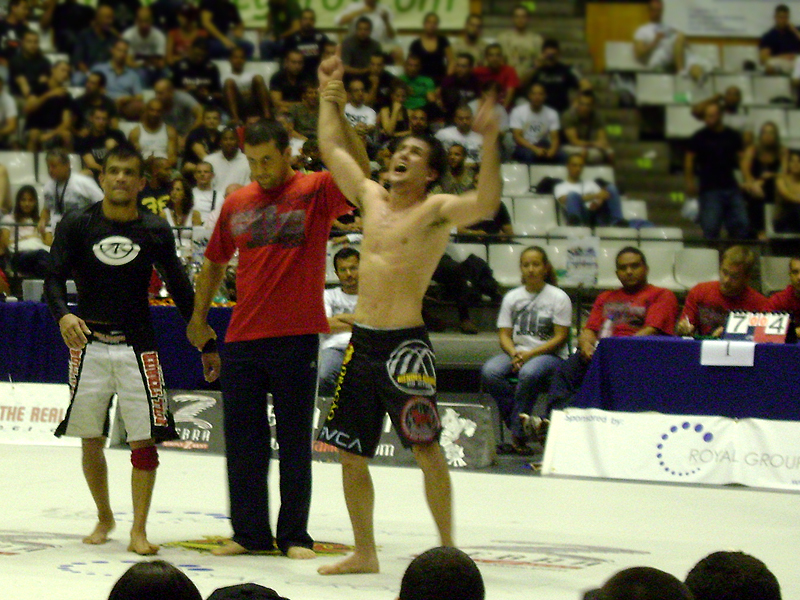 Braulio Estima is the ADCC 2009 Absolute winner! – Could you tell us a bit about your preparations for ADCC? I’m training hard as usual, At night I do the physical preparation with Camões, in the morning I practice grappling with the help of Josuel Distak and with my practice partner and ADCC champion, Ronaldo Jacaré. 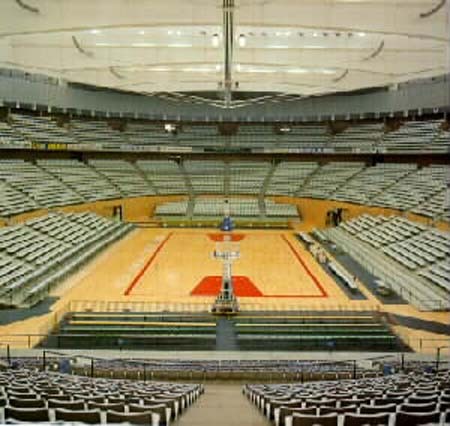 Everything is just fantastic, and I hope to get back from Barcelona with a new title to my career, if it’s God’s will. I’m feeling well prepared to do it. – Are you doing any kind of special training in your routine ? Yes! I’m focusing on the explosion and speed at morning time. At night I am also doing the physical practice according to my morning training. – What do you expect from yourself in this championship? I hope to win the Champion Title, but I know it’s not that easy. 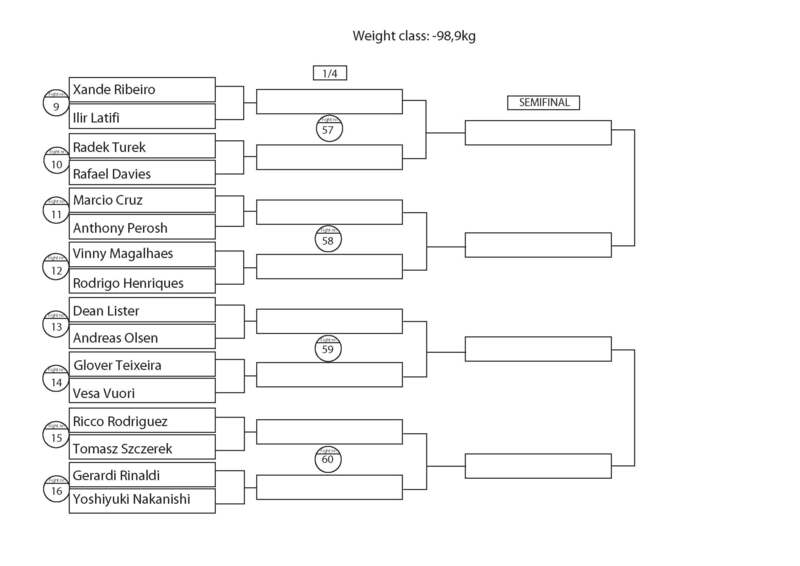 ADCC Championship holds the best athletes. 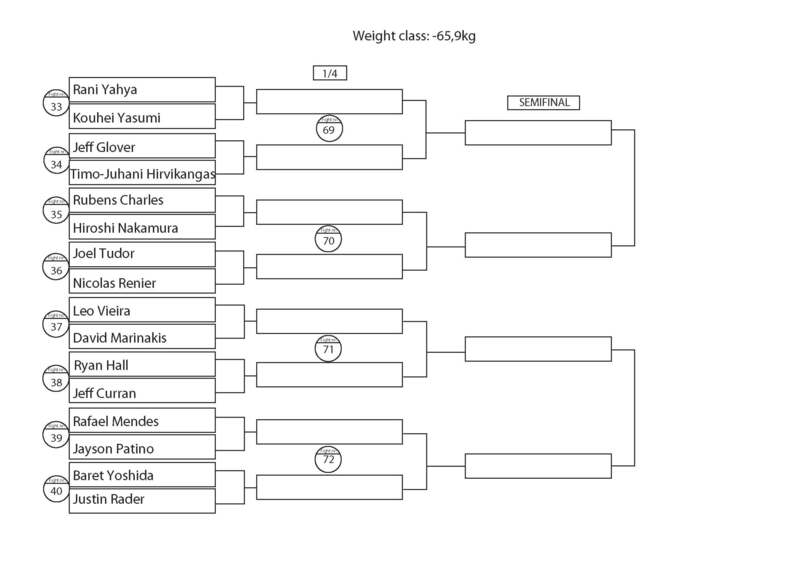 Actually, in my opinion, ADCC is a more complex and different competition. Thanks God, I’m well prepared and ready for any kind of situation on the mat. – How do see your career now on days? Every day I see that I’m in the right direction. I’m grateful for all that I conquered along my career, in the Jiu Jitsu World and MMA, where I have the best coaches and training partners, this gives me the motivation to seek my dreams and goals, I still have a lot to learn, God has blessed me, and I´m thankful for all. – How ADCC Championships will add to your career? ADCC is a worldwide high level championship, it´s good to be included in a huge organization like this, and it always brings good things too, sponsorships, the growth of the athletes in the Fight world, etc. – How do you see yourself inside the Jiu Jitsu world? I always seek to learn more and more, Jiu Jitsu gives me this option, there’s always something to improve, I like that, since when I began practicing I tried to evolve in the sport. I believe I have achieved a lot, and I see others Athletes conquer and involved. – Any message you like to share with your fans and friends?